The qualified British patent attorneys of Albright IP can provide you with expert advice and guidance, and represent you before the UK Intellectual Property Office (UK IPO), also known as the British Patent Office. The video below gives a brief overview about UK patent protection. The UK is our home territory and we draft, file and prosecute British patent applications at the UK Patent Office (the Intellectual Property Office or UK IPO) in Newport or London. What steps are involved in the patenting process? A patent application passes through a number of different stages on the way to grant. Please see the timeline below for an indication of the process involved. Please note that many different countries are available at the national and PCT stages (3.1, 3.2), and the US, Japan, China and Europe are just examples of common territories selected for patent protection. Unlike many patent attorney firms Albright IP uses a secure and immediate online filing system for British patent applications. This online filing system also provides discounted official fees, and we are proud to pass on these cost-savings in full to our clients. 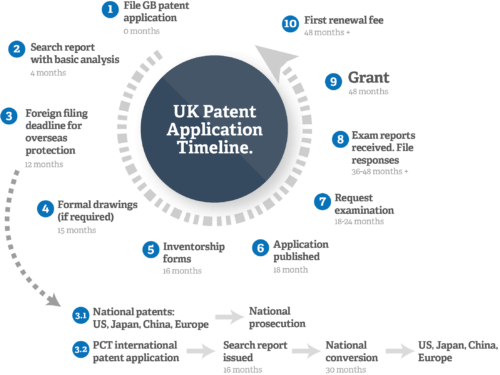 The UK Patent Office search is performed quickly, with the results being returned in around 4 months from the date of filing, and is relatively inexpensive. This can be particularly helpful for small businesses and lone inventors. Please explore the following sections for further details of the UK patent application procedure. Albright IP will prepare a draft patent specification for your approval based on your disclosure to us. In order to keep costs down, it is therefore important to provide as much information as possible about the invention at the outset. Once approved, a patent application will be prepared and filed. The application will preferably include a description, claims, drawings and an abstract. This is known as a full application. We use an electronic filing system with the Patent Office, and therefore will receive an immediate acknowledgement and official filing receipt. Sometimes, in order to reduce up-front costs, applications are filed initially without claims and an abstract. We generally advise against this, unless it is absolutely necessary, because new subject matter cannot be added to a patent application, once filed. In other words, late filed claims are limited to the subject matter included in the specification on filing. It also takes longer to receive the search results, which could be very important for your product development. The Patent Office Search Report is issued within about 4 months of payment of application and search fees, i.e. the date of filing. We will forward the Search Report to you and briefly comment on its relevance. We are happy to discuss the results of the search with you, in order to provide initial guidance and advice. If you should require more detailed analysis or review along with proposing possible claim amendments if necessary, we can provide a competitive cost-estimate. It is often prudent at this time to also consider the results of the search in light of possible infringement on your part. For example, if you were to put your invention on the market, would it fall within the scope of an earlier patent even though it is an improvement? Albright IP can discuss this with you, provide a quotation, and undertake this analysis. It is also wise to consider the infringement aspect if you are undergoing prototyping and/or manufacture. It is preferable to make changes earlier on to the design to circumvent a competitor’s patent rather than waiting for launch before discovering issues. Albright IP will remind you of the possibility of filing corresponding foreign patent applications claiming priority from your UK filing. This opportunity typically expires one year (12 months) after the filing of your British patent application. After this deadline, it is no longer possible to back date a foreign patent application to the date of your British application. Therefore, a prior disclosure may act against the foreign patent application. If the inventor of your invention is not the applicant, or is not the sole applicant, then we will remind you that the Patent Office must be notified of this, and Albright IP will put this in hand for you. This is due within 16 months of your earliest filing date. If rough or ‘informal’ drawings were used when filing the patent application, the UK IPO typically requests ‘formal’ versions which meet their rules for clear reproduction. Albright IP will again remind you of this and will prepare the formalised drawings on your instruction. These are due within 15 months of your earliest filing date. The British Patent Office will publish your patent application at around 18 months from filing. Until this point, your invention remains secret or confidential unless you yourself have disclosed it. Albright IP will record the details and dates of the published application when it is received, and a copy of the publication will be forwarded to you. Substantive Examination of your application is requested within 6 months of the publication date (i.e. up to 2 years from filing). Within around 12 months to 24 months thereafter, the Examiner at the Patent Office will issue an examination report asking us to either address issues concerning uniqueness and/or inventiveness, or allowing the application. The Examiner typically provides 4 to 6 months to respond. Thereafter, the preceding steps may be repeated until either the application is granted or ultimately refused. It is rare that a patent application being handled by Albright IP is refused unless the earlier documents found by the Examiner are extremely close to the invention. Our track record in procuring grant of patent rights for a client is extremely good. The application is finally granted or refused, and we will report this to you after noting the particulars and critical dates on our systems. Once granted, annual renewal fees are payable to keep the patent in force for a maximum term of 20 years from the filing date. We will endeavour to remind you of the need to pay renewal fees and take your instructions annually. Alternatively, we can renew the patent every year until its expiry with no further instructions. Through our qualified and experienced chartered British patent attorneys, Albright IP can fully and proactively protect your invention, giving you the patent rights to then secure your market or to obtain lucrative licence and assignment deals. Prior to filing a new patent application, Albright IP recommends that you make prior art searches to ascertain as far as you can the state of the art. This will help us to target the novel and inventive features of your invention. The European Patent Office operates a basic free searchable patents database, called Espacenet. If desired, we are also able to obtain or make pre-application searches for you. If you would like further information, please contact us using the enquiry form to the left for further no-obligation free advice. Alternatively, call us on +44 (0)1242 691 801 to speak to a qualified British and European patent attorney.